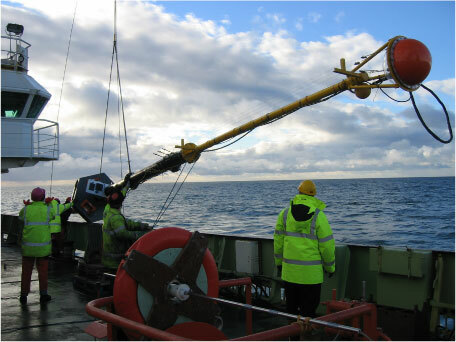 The NOC spar buoy was developed and instrumented at NOC to measure wave breaking using capacitance wave wires. A video camera is mounted at the top of the buoy to verify the presence of whitecaps. The buoy was first developed under a NERC funded UK-SOLAS project "DOGEE" and was trialed during a cruise in 2007. This version of the buoy is 11 m long and weighs nearly 1/2 a ton, which makes it difficult to deploy and recover even in fairly calm conditions. However, its large size means it can carry enough batteries to operate for 5 days at a time, allowing it to be deployed prior to a storm and recovered after the storm had passed. It can also carry other systems, e.g. a sub-surface acoustic bubble sensor developed at ISVR. In 2009 a small (5m) lightweight version was developed that could be deployed easily even in rough weather. This buoy was deployed many times during 6 cruises in the Southern Ocean on the RRS James Clark Ross between 2010 and 2013, as part of the WAGES project. 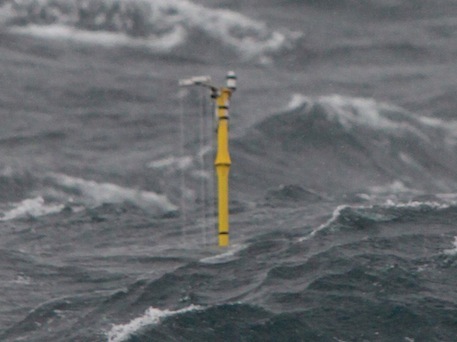 A wide range of conditions were sampled, with maximum 10 minute wind speeds of over 20 m/s and significant wave heights of 8 m.
Left - the 11 m buoy being deployed in the outer hebrides during RRS Discovery cruise D313. Right - the small version of the buoy in rough weather in Drake Passage during RRS James Clark Ross cruise JR254D. Both versions of the buoy were deployed during a 5 week cruise in November 2013 on the RV Knorr in the Grand Banks area of the North Atlantic as part of a US/UK project "HiWinGS".